One of the things that I’ve always admired about the PuSh International Performing Arts Festival is that, well, they push the arts. They push culture. And Vancouver’s arts community is the better for it. Nowhere is that so obvious than during the PuSh Opening Galas, fun events that incorporate music and interactive performances with libations and dancing. The PuSh 2013 Opening Gala was held this year on Monday night at Club Five Sixty on Seymour. At this year’s Gala (more than at any other PuSh Gala I think) I actually paid attention to the opening speeches (did it have anything to do with the fact that one of my favourite musicians, Dan Mangan, was an MC? Possibly). From Dan Mangan himself, and Vancouver’s Mayor Gregor Robertson, and PuSh Executive Director Norman Armour, the message rang loud and clear: the arts are important and we should protect them, fight for them, and (dare I say?) fund them. With the closure of the Waldorf in East Vancouver on our minds (not to mention other high-profile closures in the past year, including the Vancouver Playhouse Theatre Company), it seems to be a dark time to celebrate “crossing the line”, as the PuSh Festival is asking us to do over the next two weeks. So why do they do it? Why spend a tremendous amount of time, effort, and money on a two-week international performing arts festival? Because we need it. 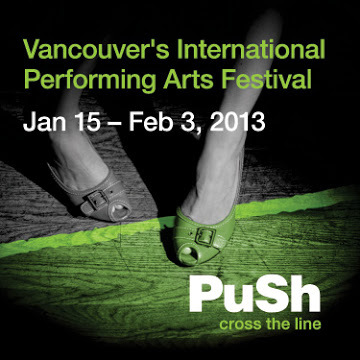 Because festivals like PuSh represent a coming together of the very best of the performing arts community, and a commitment to refuse complacency, refuse mere satisfaction with where the Vancouver performing arts scene is today, and to push to the envelope (there’s that word again), and audiences, into new territory, artistically and geographically (with productions from as far away as Taiwan, Argentina, and Belgium). Only by seeing what we’ve never seen can our arts community strengthen and become what we’ve never yet been–safely sustained, more than hand to mouth, more than dependent on the capricious whims of provincial and federal funding. More than just a seat-warmer for an eventual condo development to move in. One of the PuSh Gala’s interactive performances this year, Open Book (inspired by Human Library, a production brought to PuSh 2013 by Denmark’s Stop the Violence), is an excellent example of performing art’s capacity to “cross the line”, and to bring its audience with it. In the eerie Club Five Sixty basement, my TC and I had the opportunity to check out a “human book” for a 10-minute conversation. I checked out Patti, a psychic, who explained to me what being psychic means to her life (it makes it calmer, she says) and who believes that all people have the capacity to tap into their intuitive and psychic abilities. TC had a conversation with Bruce, a legally blind painter who uses acrylics to create highly textured works and who paints the irregularities of his limited vision onto his pieces. A performance like Open Book is not traditionally what one would consider theatre–and yet it is live, it is an experience, it is not designed to be therapeutic or necessarily educational but simply to push us, through the power of a simple conversation with a stranger, into a new place (in this case, another person’s, a real person’s, experience). Of course the Gala got me excited about What To See. What to see, what to see? Every year I have to make tough choices and every year I miss something amazing, simply because most of the festival is amazing and I can’t see even half of it. Every event at the festival (and Club PuSh) seems intriguing, new, virtuosic. Two pieces in particular are calling to me–Ride the Cyclone (Atomic Vaudeville, Victoria BC) and The Strange Undoing of Prudencia Hart (National Theatre of Scotland, Glasgow). TC’s top pick: Reich + Rite with pianist Vicky Chow (Music on Main, Vancouver). But there’s so much more, always so much more, and so many ways to cross the line. To see what the PuSh Festival has to offer this year, and decide how you want to cross the line, visit the PuSh website at www.pushfestival.ca. For more about specific PuSh events (plus the event calendar and program guide), visit the Festival Events page. Disclosure: My TC and I received comps to the PuSh Gala this year, as I have every year I’ve gone, because I have blogged and tweeted, and continue to blog and tweet, about the Festival.